I have been interested in research ever since I was in high school. I’ve always felt that studying was most valuable when the learning experience is hands on, and what could be more hands on than research? 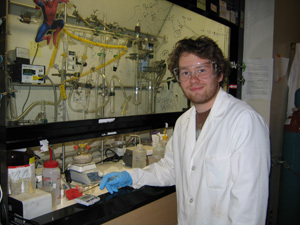 I chose to come to the University of Washington to pursue a degree in chemistry because of the opportunities provided by such a large institution. However, I began my research at the University of California, Santa Barbara during a summer internship in the Stucky lab. It was there that I first began working with quantum dot photovoltaics. On my return to the University of Washington, I quickly found a position in the Ginger lab which allowed me to continue my work with quantum dots and solar cells, work which I find both intellectually stimulating and scientifically productive. Over the summer, I worked at the Tyndall institute in Cork, Ireland, where I was exposed to another side of the scientific community. The Washington Research Foundation Fellowship has allowed me to continue working for Professor Ginger now that I am back in Seattle for my final year at the University of Washington. I plan on completing a senior thesis based on my work with polymer quantum dot blends, and am very grateful for the funding provided by this research grant. Abstract: Organic photovoltaics offer an inexpensive alternative to current silicon technologies owing to their ability to be processed from solution. Semiconductor quantum dots (QDs) have been studied recently due to their broad absorption spectra and size-tunable energy levels. In addition, ultrafast spectroscopy studies have indicated that charge multiplication is possible in the QDs, suggesting higher possible charge generation efficiencies. The near infrared bandgaps of lead selenide QDs allow for the fabrication of photodiodes sensitive to a broader range of wavelengths than devices made from purely organic materials. Our lab synthesized QDs via the hot injection method with reaction time controlling the size, and therefore the bandgap, of the particles. A range of sizes was synthesized and characterized by absorption and photoluminescence. Large, bulky ligands act as a barrier to charge separation and charge mobility. These bulky ligands must be exchanged for smaller ligands to incorporate the QDs into bulk heterojunction devices. In preparation for future spectroscopic studies and device fabrication, thick films of QDs were processed with high optical densities in the visible and near infrared. Device studies have been carried on the established blends of Poly (3-Hexylthiophen) (P3HT) and [6,6]-phenyl-C61-butyric acid methyl ester (PCBM) to prepare for PbSe QD/ Polymer devices. Initial device testing has been conducted on PbSe/P3HT blends, but with little success. In collaboration with the Jenekhe group from the University of Washington, Department of Chemical Engineering, we have selected a number of alternative polymers which we believe may form a Type II heterojunction with PbSe QD. Future device studies will include these novel polymers blended with PbSe QD in order to test this hypothesis. I entered the UW four years ago through the Early Entrance Program. All I knew about myself was that I loved math more than anything else, so fresh out of the first quarter of Steffen Rohde’s brilliant honors calculus class, I started working with Bernard Deconinck. Our goal was to determine the stability properties of some solutions of the nonlinear Schrödinger equation, which is a fundamental equation in mathematical physics, governing the behavior of modulated waves in nonlinear media. The project wasn’t without its obstacles — over the first summer I spent, I was unknowingly replicating some work done in England during the 1970s — but I kept at it, and the result of our labors is a general method for computing the stability spectra of stationary solutions of integrable equations. Math has taken me all over the world, including to Moscow, where I spent four months in 2007. There I both fell in love with Russia — I’m a Russian major now, as well as a math major — and began working with another of my collaborators, George Shabat, on another project in numerical analysis and elliptic integral theory. I have been able to give a few talks on my work — one in Atlanta, one in Vancouver, B.C., and too many to count at the UW, through the nonlinear waves research group — and the hospitality and inclusiveness of the worldwide math community has always amazed me. Thanks in part to the Washington Research Foundation, I don’t plan on stopping working on unsolved math problems anytime soon. In my spare time, I enjoy doing math, watching Russian films, baking bread, and drinking coffee. connection between the stability spectrum and the Lax pair spectrum, so often used in the solution case. We present explicit determinations of the stability spectra of all periodic stationary solutions of the defocusing nonlinear Schrödinger equation and of the Korteweg-de Vries equation, and partial results towards analytically determining the stability spectra of periodic stationary solutions of the focusing nonlinear Schrdinger equation. Our method is relatively simple and has far-ranging implications for how stability spectra of stationary solutions of integrable equations will be computed in the future. I am a Seattle native, and I am now a senior at the UW, majoring in biochemistry. My original plan upon entering college was to go into neurobiology, but while taking organic chemistry, I realized I really enjoyed making molecules. After contacting my professor at the time (Michael Gelb) about doing research, he got me started in his lab with a graduate student (Rob Oslund, my primary mentor), and I’ve now been working there for over 18 months. In that time, I have had a great opportunity learn about the lab’s substantial interests, pick up a lot of methodology, and learn a lot about graduate school at the same time. After I graduate from UW, I hope to apply for MD/PhD programs which will allow me to continue to study ways to improve human health, and both incorporate and expand on the skill set I have picked up in the Gelb lab. Abstract: Secreted phospholipases A2 are a family of enzymes which catalyze the hydrolysis of phospholipids at the sn-2 position. There is strong evidence that they are involved in inflammatory biosignaling, and they have been correlated with a number of diseases including asthma, arthritis, atherosclerosis, colorectal and prostate cancers, and others. My research in the Gelb lab in the past year has focused on designing, synthesizing, and evaluating inhibitors for a subset of the nine sPLA2s found in humans. While I have made significant progress towards this goal, I am even more excited for the coming year, where I plan to focus on three main projects. The first is to use mass spectroscopy to identify metabolites of our inhibitors in cell culture in order to evaluate the efficacy of our negative control compounds. The second project is to identify cell lines which we can use as a model system for testing our inhibitors. My third project will be to continue the fluorescent cell labeling and confocal microscopy work I began last year, in order to visually identify activity of sPLA2 activity and evaluate the cell-permeability of our inhibitors. 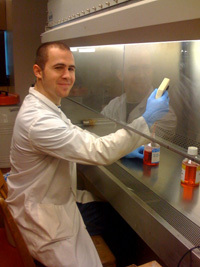 Working in the Gelb lab has allowed me to learn at a rate far beyond that available in class about relevant, cutting edge techniques, and has given me skills I will continue to use during my graduate studies and in any future career in pharmaceuticals. Growing up the daughter of two physical therapists instilled a passion for health and a curiosity about the human nervous system in me early on. When I began my first quarter at the University of Washington I had my sights set on pursuing a career in medicine but felt completely lost in how to successfully achieve that end. 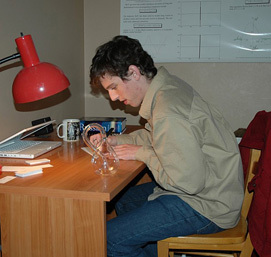 My intense desire to understand the intricacies of the correctly and incorrectly functioning human body inspired me to apply for entrance into the neurobiology program in my sophomore year. Early admittance into this program has allowed my neurobiology courses to serve as a foundation for my academic experience as an undergraduate. Through my neurobiology studies I found my true passion and have since forged what I know is the right path for me as an undergraduate. Following the first year of this program I actively sought a place in Dr. Moody’s lab knowing that his developmental neurobiology based research was something I wanted to pursue. My passion for the research I have been conducting over the past year and a half is driven both by my inquisitive nature and by the possible clinical applications my work may have for disorders in humans . An understanding of correct brain development has the potential to facilitate an understanding of later development when the mechanisms I study may contribute to pathological forms of brain activity such as seizures. Abstract: Spontaneous Synchronous Activity (SSA) plays a central role in mammalian nervous system development. In mouse cortex, SSA is vital for the development of neuronal characteristics necessary for normal information processing. For SSA to carry out its developmental functions and mature firing properties to emerge, it must begin and end within a critical temporal window. As such, how the timing and generation of SSA are controlled is a major question in neurobiology. The Moody lab has determined that a discrete pacemaker region in mouse cortex controls SSA. The question about pacemaker function has been approached from three different directions: multi-cell calcium imaging of neuronal activity, molecular studies of ion channel types, and direct electrophysiological recording from single neurons in living brain slices. My work thus far has used the technique of single-cell electrical recording, patch clamp, because it provides access to the most direct information about pacemaker mechanisms via single cell behaviors and responses. A likely candidate for a pacemaker current is the low-threshold inactivating (T-type) Ca2+ current so we have investigated the role this current plays in SSA using the three previously mentioned experimental approaches. Molecular studies of ion channels have shown that the T-type Ca2+ channel protein is highly concentrated in the ventro-lateral pacemaker region which matches the point of origin of SSA waves detected in our multi-cell calcium imaging experiments. Additionally, imaging experiments have shown that Mibefradil, a T-type Ca2+ blocker, blocks SSA. My previous patch clamp recording analysis comparing pacemaker and follower neurons shows significantly longer burst durations in pacemaker neurons, which is consistent with the presence of T-type Ca2+ currents. From these findings my future experiments will attempt to further elucidate the mechanisms of pacemaker initiation of SSA in mouse cortex using single-cell electrical recording to isolate the T-type Ca2+ current in voltage clamp recordings. I will also investigate the effects of Mibefradil on SSA in single cells in the pacemaker and follower regions and determine if the pacemaker quality of the initiation zone is a function of a network property or individual pacemaker qualities of the discrete component cells. Upon entering the University of Washington my main interests focused on science and discovering, as well as participating in, the mechanisms by which it provided for the welfare of the world. In short, I liked thinking and learning about science, but truly had no idea of what actually was incorporated in the idea of it. I didn’t have to wait long, however, in my first quarter at UW my views and interests would be drastically influenced. I took an anthropology class as a part of the UW Honors Freshman Interest Group and discovered a world of science that would motivate me to initiate my journey of wanting to make a difference. This class focused on a study of the Igbo Tribe of South East Nigeria. We dove into the abstract and mystic mechanisms by which their culture operates, and by the end of the quarter I had managed to bridge the ideas of this anthropological study with my passion for science, revealing to myself a drastically underrepresented field of research that bridged the boundary between the study of infectious disease and culture, producing a mechanism by which a sustainable idea of Public Health can be achieved. 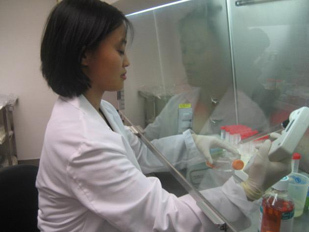 Since then, I have continued on this path by participating in research, studying HIV-1 in low-level infected patients that span the globe and serve as the most promising human model to limit HIV-1 infection to such low levels that they no longer bring about immunodeficiency. This research is the first learning experience on my path of success. It serves as a key ingredient that allows me to achieve an in depth understanding of this issue from the perspective of microbiology, which is no doubt essential in working for a cure to some of the world’s greatest health disasters. I have also conducted an ethnographic research study in Sierra Leone during the summer of my freshman year, which is still on going. I’m very thankful to the WRFF for their grant enabling me to continue this research and the pursuit of goals. Abstract: Vaccines are the most effective and affordable public health interventions to halt the HIV pandemic. Unfortunately, a preventive vaccine is not a realistic immediate goal. Instead, vaccine efforts are currently focused on a hypothesis that has shown promise in SIV-monkey models – namely a vaccine that will keep the virus in check to such low levels that the likelihood of transmission and disease progression will be significantly reduced. However, fundamental differences between SIV and HIV-1 preclude direct extrapolation of vaccine correlates from monkey models to human infection. The need for pioneering new approaches to AIDS vaccine design became even more apparent after Merck’s leading candidate, MRKAd5, which showed promising control of virus levels post-infection in monkeys, failed to provide any degree of protection against or control of HIV-1 infection in humans. Thus, understanding how to protect against HIV ultimately requires evaluation of its natural host – humans. There is general consensus that studying individuals who are repeatedly exposed to HIV-1 yet remain uninfected may provide invaluable information to aid in the design of vaccines and therapeutic approaches. An important issue is to determine whether a proportion of these “HIV-protected” persons harbor low levels of HIV-1 infection. Unfortunately, almost all cases of such extraordinarily low level HIV-1 infections (ELLHI) reported by conventional technologies appear to be due to laboratory error, or are without sufficient confirmatory studies. This is primarily due to the lack of methodologies that are sensitive and specific enough to convincingly detect ELLHI. The Zhu Lab has shown, for the first time, that people who can control HIV-1 at extremely low levels exist in Seattle, which represents the most relevant human model of HIV-1 control for vaccine development. Such ELLHIs have been proven by developing and employing a sensitive and laborious nested PCR assay. Most recently, The Zhu Lab has improved upon the technology of this ultrasensitive assay by markedly increasing the throughput. This allows for more population-based research, examining the frequency of such ELLHI in high-risk communities that are afflicted by HIV-1 in diverse regions of the world. Growing up, I have always had an interest in science, more specifically, in what science can do for the human body. 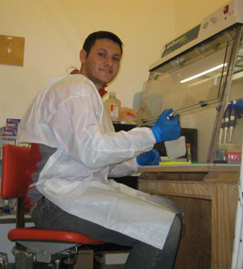 At the University of Washington, I had the opportunity to participate in a variety of research areas before finding my interest in the field of bioengineering. I was fascinated with the integration of engineering and medicine and the role of biotechnology in the medical field. 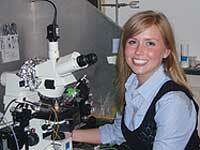 In the summer of 2008, I was given an opportunity through a NIH fellowship to explore the clinical side of research. I spent my summer working with Dr. Corinna Palanca-Wessles at the Fred Hutchinson Cancer Research Center and shadowing her at the Oncology clinic at Harborview Medical Center. The excitement of being able to alternate between the forefront of research and the forefront of patient care helped me bridge the gap between the laboratory and the clinic. The close interrelationship between the two environments that was introduced to me by my mentor also gave me new perspectives on my goals for the future. In my current project, I hope to bring the engineering side of polymer design and synthesizes into the clinical setting by using it to delivery cancer therapeutics to tumor cells. In the future, I hope to be the person that is able to bridge that gap between research and clinical practice. I hope to be pursuing higher education through a MD/PhD program so that I can have a unique understanding and appreciation of both sides of the medical work and to be able to bring it together elegantly in daily practice. Abstract: Cancer contributes to a large portion of mortality rates both in the US and many parts of the world. More than 25% of deaths in the US and 12% of death worldwide are attributed to cancer. However, new discoveries in the last decade on cellular and molecular pathways has improved the understanding of tumor cell growth mechanisms, leading to innovations in drug development that has extended survival rates and prolonged the quality of life for people around the world. The important discovery of the RNA interference pathway has lead to the development of a promising tool in cancer treatment: siRNA to silence genes that contribute to tumor development. However, the application of siRNA therapeutics has been limited by cellular pathways that prevent cell penetration and cause enzymatic degradation of biomolecules. This project aims to design and synthesize a novel carrier system for siRNA therapeutics that consists of a tumor-specific targeting component and a pH-responsive membrane disruptive polymer component to protect the therapeutic from degradation and enhance uptake of the delivery system into the cell. Antibody targeting tumor-specific receptors will be attached to the polymer via streptavidin-biotin technology. The polymer will be synthesized using RAFT polymerization and biotinylated. This project explores methods to conjugate streptavidin to antibody and optimizes the method to biotinylate the polymer carrier. The end result will be an immunopolymer carrier system for siRNA that targets tumor cells through surface antigens and penetrates the cell via receptor-mediated endocytosis. Once synthesized and characterized, the delivery system will be tested in vitro to enhance cellular uptake of GAPD siRNA. The specificity of the tumor targeting will be analyzed using flow cytometry. The pathway of the polymer uptake will be verified using fluorescent microscopy, and the efficacy of gene knockdown by siRNA therapeutics will be evaluated using quantitative RT-PCR, Western Blot and cell viability tests. The results will be evaluated and the delivery system will be optimized to reduce cytotoxicity and enhance siRNA delivery. I was, and still am, amazed by the countless opportunities available for UW undergraduates to conduct cutting-edge research. Shortly after coming to the university through the Early Entrance Program, I knew I wanted to be involved in a project that could complement my science classes and allow me to address and explore my varied interests. For the past three years, I have worked closely with Dr. Kristin Swanson in the Department of Pathology on the mathematical modeling of glioma (a type of brain tumor) in vivo growth and response to therapy. 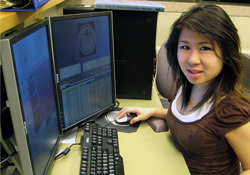 The lab’s research is uniquely interdisciplinary; my current project combines aspects of neuropathology and biomedical technology to analyze imaging data obtained from patients receiving treatment at the UW Medical Center. The results could directly impact the development of clinical applications in the near future, which is very exciting! Through Dr. Swanson’s guidance and mentorship, I have gained a personal introduction to the world of academic research. My experience in the lab has been the most substantial contributor to my education thus far – even more than the sum total of my coursework. I hope to apply the skills I have cultivated towards completing an MD/PhD degree and pursuing a career in oncology research. Abstract: Gliomas, the most common primary brain tumors, are extremely aggressive and uniformly fatal, recurring inevitably despite treatment by surgical resection, radiation therapy, and chemotherapy. This is especially true of high-grade, rapidly growing glioblastoma multiforme (GBM) which account for nearly half of all gliomas. Current imaging modalities are unable to assess the full extent of diffuse glioma cell invasion. To more accurately understand the dynamics of GBM, Dr. Kristin Swanson has developed a mathematical model incorporating the diffuse invasion (migration rate D) and proliferation (ρ) of glioma cells. We have collected a database of patients with two serial magnetic resonance imaging (MRI) prior to any treatment or surgery. By measuring tumor volumes on these images and assuming a spherical volume, a mean radius and volume for each imaging date can be found. The radial rate of growth, which is linear according to the model, can then be calculated for the determination of the patient-specific model parameters D and ρ. My research aims to evaluate the influence of anatomical location on the model parameters, D and ρ. The variability of D, ρ, and tumor growth velocities are functions of the glioma’s spatial location in the brain, with respect to distributions of white and grey matter. 3D spatial computer simulations will be utilized to illustrate growth kinetics and observed spatial variability. Based on sets of model parameter values, a simulation algorithm can create visualizations of model-predicted untreated tumor growth. Comparisons of the simulation results to observed patient progress will serve to further validate the model technique, with the model prediction as a virtual control. This project is a direct response to published reports citing tumor location relating to patient survival. Model simulations have the unique ability to test this hypothesis, and to more clearly refine and investigate the role of anatomical influence on glioma growth kinetics.